PKanalix can be used via a graphical interface to easily define settings and rules, check the calculations and display the results. It can also be used via R for powerful scripting. PKanalix calculates NCA parameters with industry-standard methods, and automatically generates a full set of plots to visualize the data, the distributions of calculated parameters and correlations with covariates. All results are available as tables and summaries, and as interactive plots for a fast and intuitive interpretation. 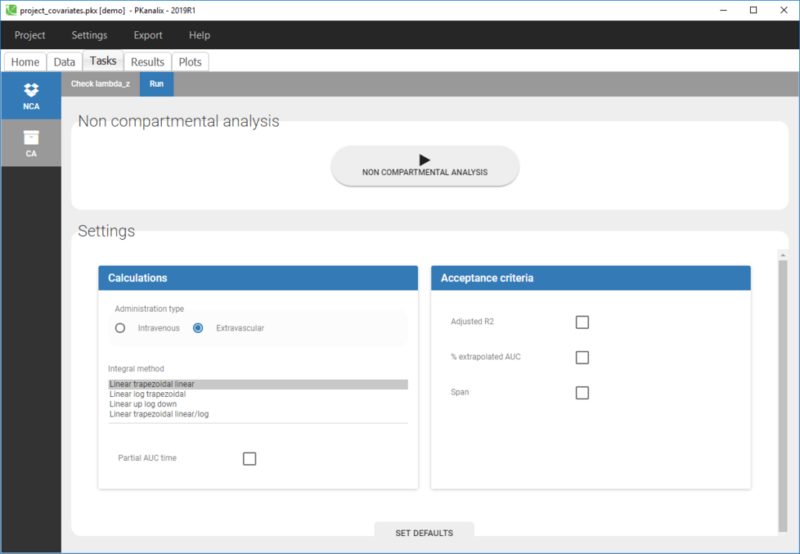 All settings are saved in the project for reproducible results, and the integrated validation suite ensures correct installation and calculation. Calculation of the parameters in the Compartmental Analysis framework is also proposed with a large library of PK models. In addition, it includes a direct link toward population modeling using Monolix. This task consists in defining rules for the calculation of the (slope of the terminal elimination phase) to be able to compute the NCA parameters. This definition can be done either globally via rules (e.g adjusted R2 or time window) or on each individual where the user can choose or remove any point for the calculation. The second main feature of PKanalix is the calculation of the parameters in the Compartmental Analysis framework. It consists in finding parameters of a PK model representing the kinetics in compartments for each individual. Automatic initialization is performed for a better convergence of each parameter for each individual. All NCA and/or CA outputs are displayed in sortable tables and exported in the result folder in a R-compatible format. Interactive plots are also proposed for straightforward interpretation of the results. The format of the data set is shared across all applications of the MonolixSuite. The main rules to format a data set for PKanalix are presented on the PKanalix documentation. A general web site for the data set formatting for PKanalix and Monolix is proposed here. Our solutions are designed for ease of use and rapid setup of the analysis to run. PKanalix can be used via a graphical interface or R for powerful scripting. This means less programming for you and more focus on exploring models and interpreting results to deliver in time. An NCA or CA analysis can be setup in only a few clicks. Tables and plots are automatically generated. Plots can easily be customized. A dedicated web site for PKanalix documentation is proposed here.